After our "How To Get Fit with VR" (Part I and Part II) articles we received a surprising amount of questions on Reddit and on our Facebook page. The most frequently asked one - "What about the sweat?". We've showcased different headsets at a number of events where hundreds of people use the same headset, and lots of them sweat excessively even without playing fitness games. We're talking about 10 minutes of "Job Simulator" here, and the foam pads are dripping. And while we're totally okay with the fact that some people tend to sweat a bit more, wiping and drying the foam after every use is just not enough. So we searched for some possible solutions for this particular problem, regardless if you're the sole user of your VR headset, or you're showcasing it in a store or at an event. After researching different brands like Cusfull, Hyperkin and VR Elite Gear, we stopped at VR Cover. We're not sponsored by these guys in any way, but they seem to offer the best solution to a home VR user's sweat problems. First, they have cloth and leather covers for your foam pads. The cloth cover is cheaper, machine washable and thin, but it's not appropriate if the headset is used by lots of users. You can't clean it easily with alcohol, so if you often share your Vive, Oculus or Gear VR with friends – get a leather one. The replacements come in three sizes – 6mm, 14mm, and 18mm. The 6mm is more comfortable, especially for people with glasses, the 14mm fits better for people without glasses, and the 18mm is actually a hybrid between cotton and foam. Some people find it more or less comfortable, but we think it's probably the best one to use if you sweat excessively, especially while playing fitness games. If not - we suggest you take the thinnest one. 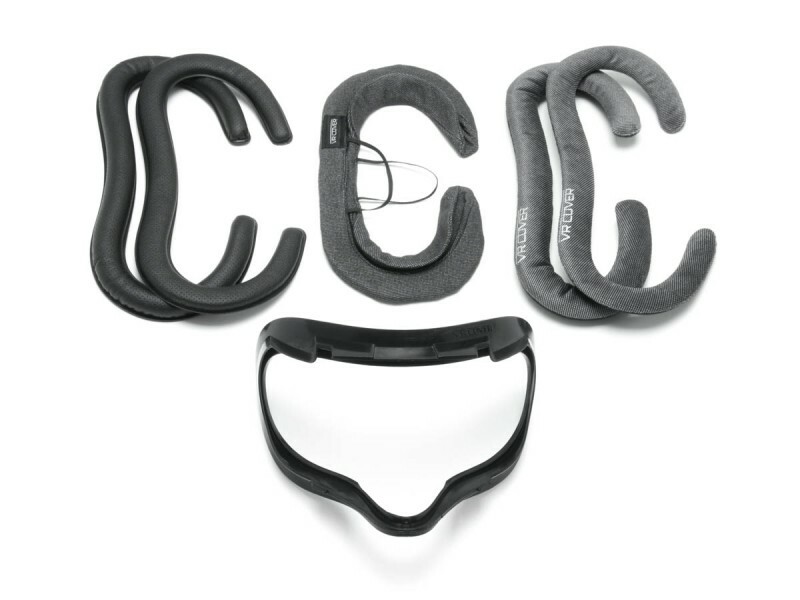 Check out the other brands as well but they seem to be offering just foam guard replacements and not so much sweat protection. If you are like us and you’re showcasing your VR headset to lots of people at different events or in a store on a daily basis, you might just need disposable covers. Fortunately, brands like Lunies, Orzero, Hurricanes, MDW, and Beracah have the solution you need. They are all manufacturing different disposable covers in packs of 50 or 100, as 50 pieces cost about as much as one cloth VR Cover – which is about $20. When the headset is used by dozens of people in a short amount of time, this is the best solution in terms of hygiene. However, it might turn out a bit too expensive if you showcase the headset to 100 people every day, so think about it – can you clean the foam pads 100 times a day with alcohol or you prefer to buy 100 pieces of disposable covers and forget about the cleaning? In the end, if prices like $20 or $30 for foam covers or replacements don’t make you sweat, but playing games in VR does – get one and have a much more comfortable VR experience. The other headset users will thank you as well.